I’m super-excited to be sitting here and writing up this post, ever since Makeup Revolution launched I’ve been meaning to get some of their products but it wasn’t available in my local store and with different press events happening I kept pushing it back. A couple of weeks ago to my delight I received a lovely parcel – from Makeup Revolution! First thing is first, considering that Makeup Revolution products are extremely affordable they still have adorable packaging which I love. As you can see in the pictures above this comes in a black box with deep gold writing making it look extremely sleek, sophisticated and lovely. 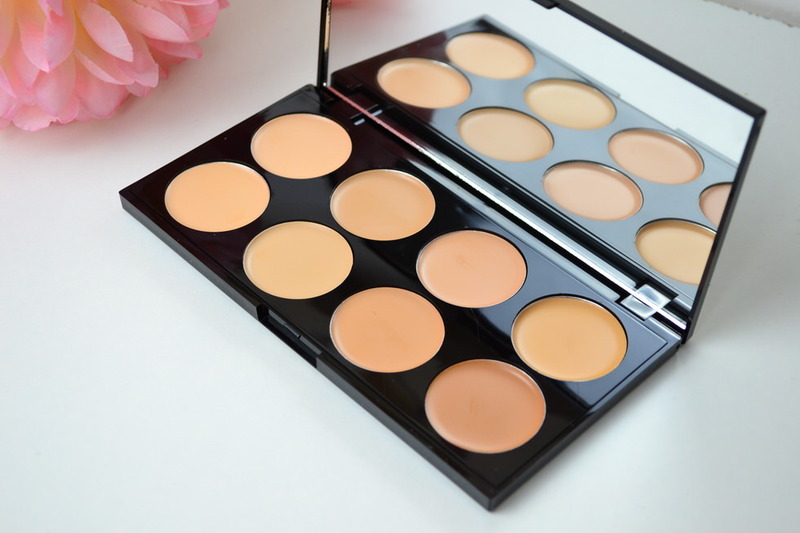 Concealers are very hit and miss especially when they come in a palette and ESPECIALLY when they’re a cream concealer – they normally end up being to ‘cakey’ or heavy on the skin and most times don’t blend well and look awful. However I’m so surprised at how lovely this palette is, the colours all apply/blend beautifully on the skin, they feel lightweight and give you beautiful, even coverage. – On and around the eye area to brighten / even out skin tone. – On eye lid to create a base for your eyeshadow / makeup. – Can be used to define the eye area without the need for eyeshadow. The lasting power of these concealers are great, sometimes they can look great when applied and then during the day end up looking odd. I apply this in the morning where needed, normally on the under eye area to brighten and by the evening my skin still looks great and the concealer is still ‘concealing’ …….it looks exactly like when applied in the morning so overall I am extremely impressed! 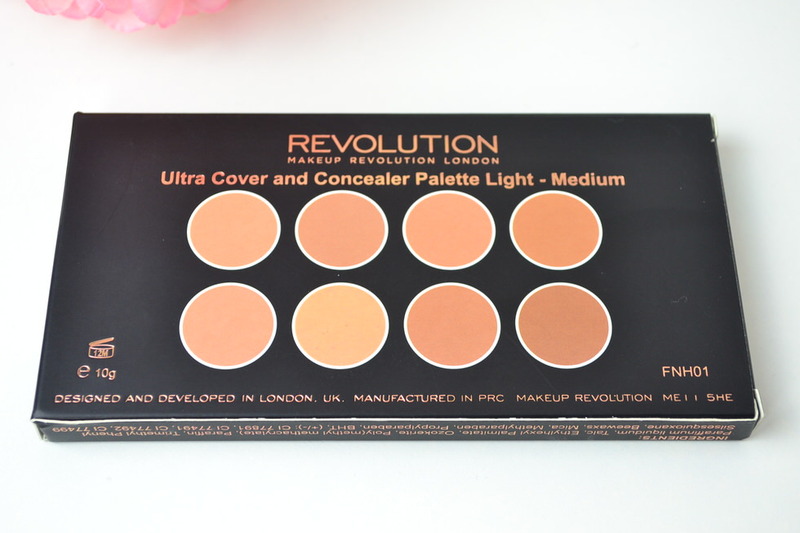 Makeup Revolution have really impressed me with this palette and I love that it’s not just a concealer, it can be used to contour (natural / daytime) conceal and brighten the face without using too many products. This is an amazing palette , I definitely need some..
Great review! I’ve been thinking about buying some Makeup Revolution beauty products. I already have Iconic 2 eyeshadow palette and I’m absolutely in love with it 🙂 This conceal palette look lovely too. I love the idea of a makeup palette for foundations and concealers! Perfect for all year ’round! WOW! I hadn’t heard of Revolution makeup before this post but it seems pretty awesome. It seems like a great palette although I’m not sure there are dark enough colours in there to contour as dramatically as I like to do. I would def use it for highlighting and the price is a real plus! Great review! I love the packaging. It looks really sturdy and classy. I’m not big on concealer palettes as I end up not using some – if not most – of the shades so I only get the colors that I use. It looks like a sleek palette packaging. Looks like an adorable product! It would be awesome to see a post about the other concealer colors, green for example. Wow such a need products reviewing. This is the first time for me to hearing about this type of palettes stuffs. So much interesting:). Wish you a warm and beautiful day honey. I don’t use a concealer, mainly because I can’t seem to find a good one. Glad to hear this palette works for you! what a great palette of concealers!!! Awesome!! I’ve been wondering about contouring and making it look more natural- this is perfect! Another great review and Im so proud of you for your videos!! This seems like a great palette for that money and you have so many shades to choose from. When it comes to concealers I always have hard time finding the right shade for me. That looks like a good palette and wow, you can’t beat the price! Are these available in the US? It does look really natural. Do you think it’d work well with really dry skin? I just love watching your how to use videos! You always give us great ideas and tips! What an affordable palette! Love how it doesn’t get cakey and it comes in different shade! Wow this sounds amazing and you can’t beat the price!! Great review, babe! This seems like a winner of a palette! 🙂 Yay for beauty scores!